Frida began on my 28th birthday. I had a little art party at my aunt's home in West Covina to celebrate. I put out a ton of art and craft supplies and decorated the yard with lights. I had a large canvas I was anxious to cover in paint. I covered it in colors that fit my mood in the moment, with strokes that expressed how I was feeling. The following day, I decided to put Frida on this colored canvas. I found a photograph that I really liked. I was drawn to Frida at first because she is a well known artist of Mexican American descent. Through her life and art, to me, Frida represents drama, color, and identity. 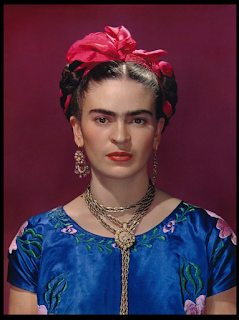 Did you know that Frida was born on July 6th, one day before me? That summer was the space between completing grad school and traveling up north to live in the Bay Area. I couldn't wait to complete my internship and make the change to a new town. I had been looking for work in San Francisco and was optimistic about what I would find by being local. At my aunt's home that July I felt independent and creative. The space was cozy and familiar. There was room for me to spread out, and I did. I enjoyed painting Frida during different phases of the process. At one point, she looked very masculine and robotic - almost like the terminator. I liked how she seemed strong but incomplete. Sort of how I felt at the time. I had a lot of fun painting Frida, which is really important to me. Sometimes I get frustrated with results and need to take a break. But I was really flowing at this particular time. This was the first time I tried to paint from a photograph.